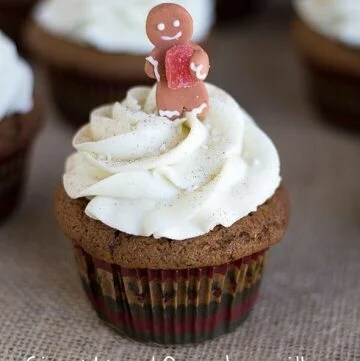 These gingerbread cupcakes with white chocolate frosting are spiced up with loads of ginger and cinnamon. 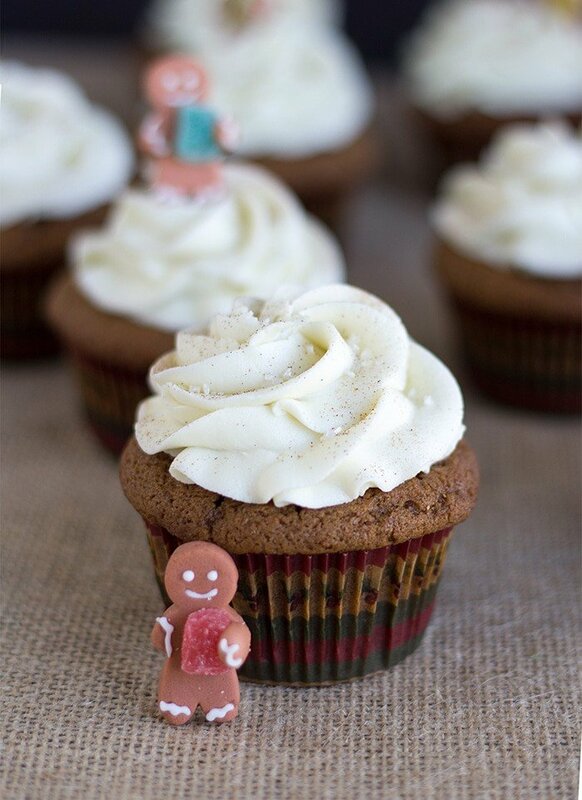 They’re topped with a heavenly white chocolate frosting, sprinkle of cinnamon, and a cute gingerbread decoration. I haven’t made a delicious cupcake in quite a while. So, I put together gingerbread cupcakes with white chocolate frosting. It was a pretty big hit too. What makes them even better? Those adorable little gingerbread cupcake toppers. They scream pick me up and squeeze me, don’t they? Yes, I thought so too. 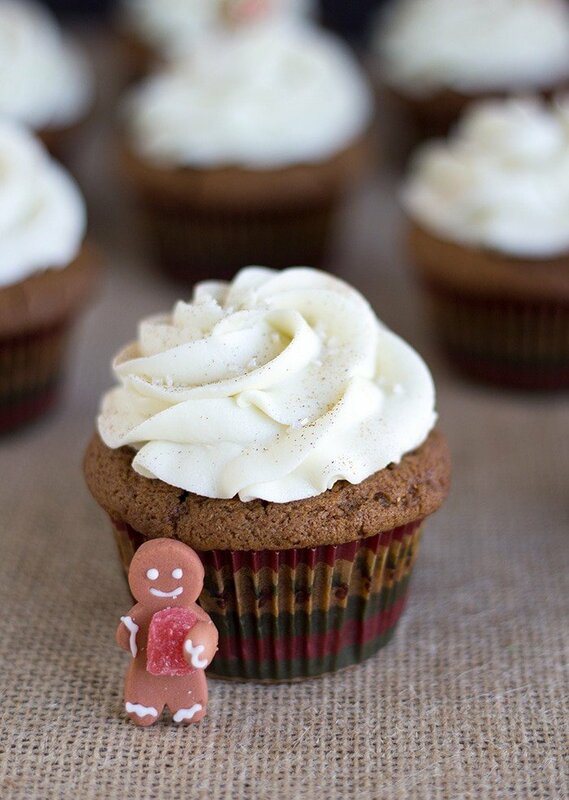 The gingerbread cupcakes are spiced up with loads of ginger and cinnamon. Gahhh, I love ginger so much. Then it’s topped with this heavenly white chocolate frosting. The white chocolate frosting pairs well with the gingerbread. The white chocolate provides a smoothness to the frosting and really balances out the cupcake. It’s a package deal. 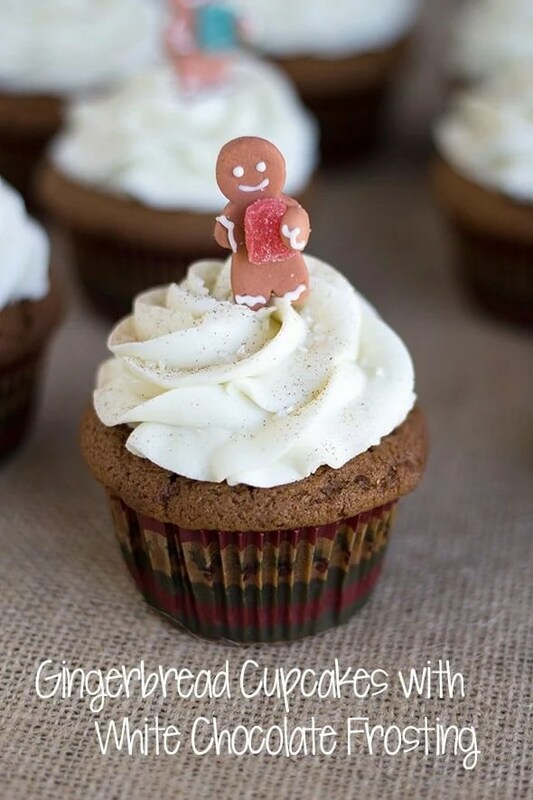 I originally made this gingerbread cupcake recipe and posted on Goedekers two years ago. Crazy to think it’s been that long, but I thought I would bring it back home and post it in full here. I plan on adapting it for some cakelets in a couple of days. I need to go shopping and find a cute little topper to stick on them too. If it comes down to it, I could probably pipe something cute instead. We shall see. 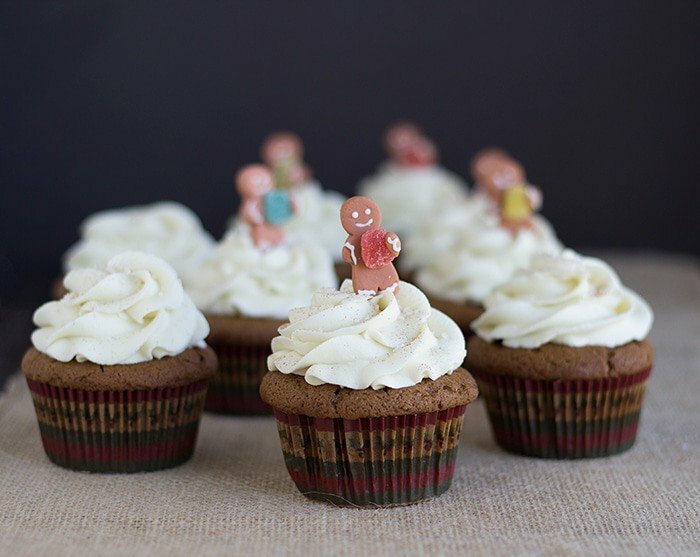 These little gingerbread toppers make me think of those ninja gingerbread cookie cutters. Wesley always talks about how I should get them. I almost went for it last year for Lucian’s birthday. He used to take taekwon do and it was only fitting to make little ninja cookies, but I backed out. I think I saw them at Home Goods, but thought I could get them cheaper on amazon and then just dropped it all together. I do the same thing all the time at Barnes & Noble. I go in there and find books that I cannot live without. I quickly hop on my phone and check the price on Amazon. I then decide that it is a ton cheaper to get it online and leave the store. I later go on Amazon and read all of the reviews and depending on how that goes I’ll either buy it or drop it. Does anyone else get online and read reviews on things before purchasing them? I think I basically do it with every single thing I want to buy. I want to hear the good and the bad. This would normally drive my husband crazy because he cannot stand when I go back and forth on things, but he is also a crazy review reader. Well, that got off topic quickly. At least now you know about my shopping habits. Important things, friends. 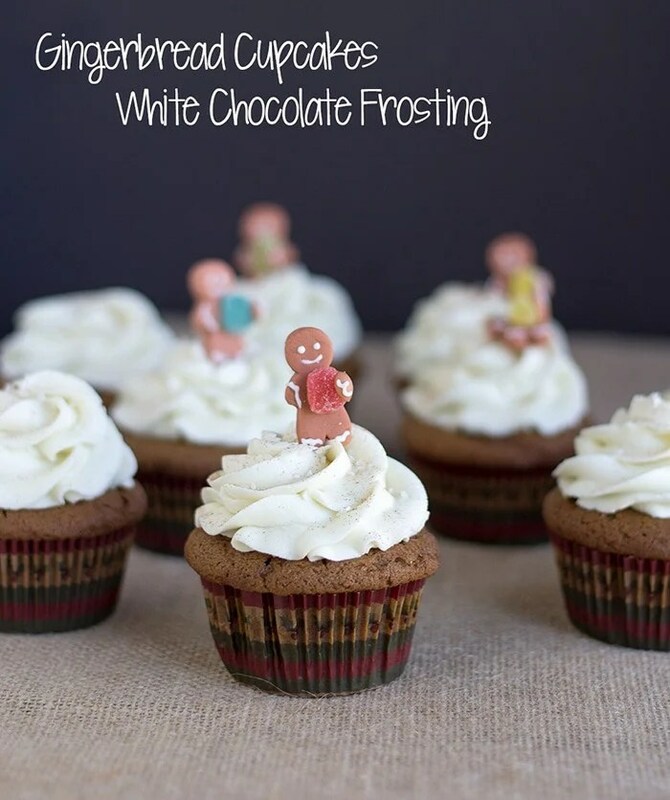 The white chocolate frosting really complements the gingerbread cupcakes. Begin heating the butter and white chocolate chips in a double boiler until they’re completely melted. Remove the mixture from the heat and cool before moving to the next step. After the mixture is cooled, beat with a hand mixer for 1 minute. Add in the powdered sugar and beat until it’s combined. If the white chocolate frosting is too thick, add milk. In a large mixing bowl, add in butter, vegetable oil, brown sugar, and granulated sugar. Mix on medium until light and fluffy. It will take about 2 minutes to come together and cream. Add in the molasses and mix until combined. Add in the vanilla and the eggs one at a time. Once the first egg is completely incorporated, add in the second egg. In a separate bowl, sift the ginger, cinnamon, nutmeg, clove, baking soda, baking powder, and cake flour. Add a third of the flour and mix on low until combined. Add half of the milk into the batter and mix until combined. Repeat with another third of flour, milk, and then a third of flour again. At this point, all of the flour and milk should be incorporated. Scoop into the paper liners and give it a tap on the counter. Place into the oven for 22 to 24 minutes or until done. To check to see if the cupcakes are done, place a toothpick into the center of a cupcake. If it comes out clean or with a few moist crumbs on it, it's done. If it has raw batter, it still needs a few minutes. Be sure to not open the door too soon otherwise the cupcakes may fall. Let the cupcakes completely cool. Then frost and decorate. In a double boiler, add in the butter and white chocolate chips. If you don't have a double boiler, add enough water to cover the bottom of a saucepan. Bring it to a simmer and add a heatproof bowl that sits on top of the saucepan to it. Make sure the water isn't touching the bottom of the bowl and that there is always water in the saucepan. Whisk the butter and white chocolate chips until they are completely melted. Once the butter and white chocolate chips are melted, remove from the heat and let cool for 10 minutes. Instead of waiting 10 minutes, I placed mine on a stand mixer and whipped it with the whisk attachment until it cooled down. If using a hand mixer, after the 10 minutes cooling, beat on medium for 1 minute. Add in the powdered sugar and mix on low until combined. If it becomes too thick, add in the tablespoon of milk. If it's still not to your desired consistency, add the milk by the 1/2 tablespoon until it is. Whip an additional minute or two until the frosting becomes light and fluffy. Place in a piping back with a 1M tip and pipe beautiful swirls on the cooled cupcakes. Sift a very small amount of the cinnamon through a very fine mesh sifter to get a dusting on your cupcakes. If you dump the whole teaspoon through the sifter, it's going to be a ginormous mess. Don't do that! Just sprinkle. Then add a few sprinkles to the tops. Thank you! They were delish! Those gingerbread men really brought the cute factor! That chocolate frosting is definitely calling me. I am loving these cupcakes. Thank you! The frosting was wonderful and incredible to pipe with.